Pocket Informant from WebIS has been giving Blackberry and Windows Mobile users a solid PIM for the the past 8 years. They have taken that experience and are now offering up a fully featured PIM for the iPhone and iPod Touch. It’s priced at $13. Some features include a built-in calendar that syncs over-the-air with your Google Calendars; Franklin Covey and GTD based to-do (Tasks) that sync with the ToodleDo online service; Full blown search of your appointments and to-do’s and contacts; and future sync support for iCal, Things, Remember the Milk, Omnifocus and others. 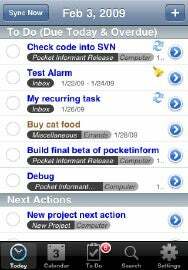 For people coming over from the Blackberry or Windows mobile who are used to having their calendar and tasks all in one basket, Pocket Informant looks to be a strong contender for the iPhone. It is missing some features that its Blackberry and WinMo counterpart has, but further enhancements are planned, according to the application’s Web site.